For reasons which are mysterious to me, this blog has become full of sauropodomorphs of one kind or another. It's been a good year for them. The latest is Ledumahadi mafube from the Elliot Formation of South Africa, an early giant near the base of the sauropod tree. The holotype individual of Ledumahadi mafube, taken from the upper part of Figure 1, McPhee et al. (2018). Genus and species: Both "Ledumahadi" and "mafube" are from the Southern Sotho (Sesotho) language. "Ledumahadi" means "a giant thunderclap", referring to the animal's size (with a wink to the "thunder lizards"? ), and "mafabe" means "dawn", a reference to its "stratigraphically early position". You can put it together as "a giant thunderclap at dawn". Citation: McPhee, B. W., R. B. J. Benson, J. Botha-Brink, E. M. Bordy, and J. N. Choiniere. 2018. A giant dinosaur from the earliest Jurassic of South Africa and the transition to quadrupedality in early sauropodomorphs. Current Biology (advance online publication). doi:10.1016/j.cub.2018.07.063. Stratigraphy and geography: Lower Jurassic Upper Elliot Formation, basically Hettangian–Sinemurian (Sciscio et al. 2017, leaving aside the part about the base of the UEF potentially being latest Triassic), "Beginsel farm, 25 km southeast of the border of the town of Clarens, Free State Province, on the border of South Africa and Lesotho" (McPhee et al. 2018). I suppose you could call it just Hettangian, given the stratigraphic position of the "Highland Giant" in Sciscio et al. (2017). Holotype: BP/1/7120, postcranial bones including a partial neural arch from a cervical vertebra, three dorsal vertebrae, two fused sacral vertebrae, two caudal vertebrae, a chevron, the right ulna, two metacarpals, the distal third of the right femur, and an ungual, pertaining to an adult approximately 14 years old. The repository is the Evolutionary Studies Institute of the University of the Witwatersrand in Johannesburg, South Africa. If nothing else was to come out of this, Ledumahadi mafube is an evocative and memorable name, and McPhee et al. should be commended. If you're going to bestow a name on a fossil, with the idea that it will be circulated for as long as people will be interested in paleontology as a science, you should always try to find something more interesting than "Placename-osaurus" (or "Placename" plus any of the other common endings, such as -venator, -raptor, -titan, -odon, -long, -pelta, -ceratops, etc.). This is eternity we're talking about—have you no poetry in your soul? Stick the place name in the species as an -ensis if you must. 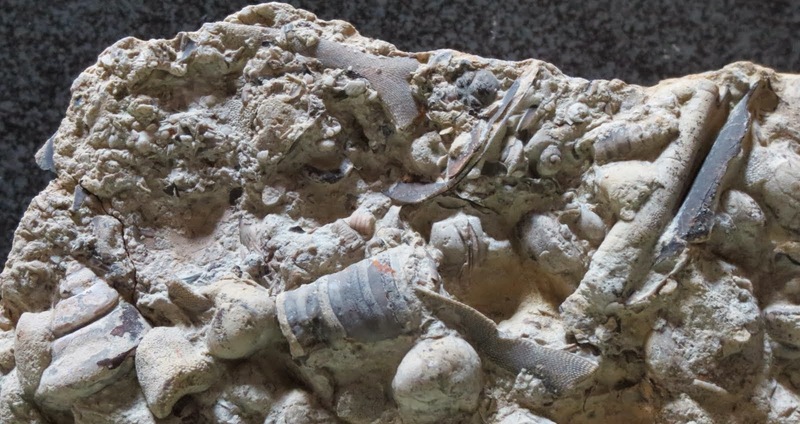 L. mafube is another of those species based on fossils recovered a couple of decades before being described. As described in this Everything Dinosaur article from 2015, the first bones were discovered back in the 1990s during construction for the Lesotho Highlands Water Project. The species was known informally as the "Highland Giant", and shows up as such in McPhee et al. (2017) (an essential work if you're trying to keep track of Elliot Formation sauropodomorphs, and freely available) and Sciscio et al. (2017). 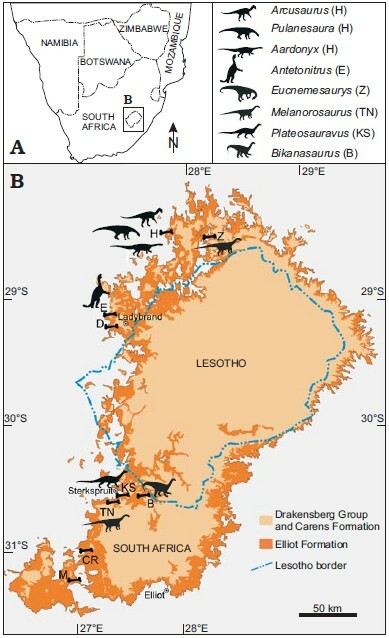 All of these and more (for reference, Ledumahadi was found about where the hands of the Melanorosaurus are on the north side of Lesotho. Figure 1 in McPhee et al. (2017) (which see for full caption). McPhee et al. (2018) estimated the weight of the type individual as 12 metric tons. Weight estimations for dinosaurs, especially rather incomplete dinosaurs like this one, should be recognized as rough, but even if we knock it down a few tons, it's still impressively large for an Early Jurassic dinosaur. It's up there with the heaviest bipedal and quasi-bipedal dinosaurs, such as the largest theropods and hadrosaurs (it's worth remembering that even the largest hadrosaurs were still much more hindlimb-dominant than sauropods of comparable size). One of the ways sauropods dealt with the challenges of their size was columnar limbs, but L. mafube did not have this advantage; instead, the knee joint of the femur is built for an animal with flexed knees, and the ulna does not have adaptations for a pillar-like posture. Although L. mafube had an anatomical spring in its step, we can safely assume that this animal did not scamper or bound at adult size. In fact, the end of the femur is quite robust and bulky. These flexed limbs lead into a primary concern of McPhee et al. (2018), that L. mafube was in fact a quadrupedal animal. This may not sound like a controversial suggestion to you, considering the size of the animal. If you haven't been following sauropodomorph chatter, though, I will mention that posture has been an issue of a lot of discussion. You can get a sense of it from looking at restorations of "prosauropods" over the past few decades. From the 1970s into the 1990s your typical Plateosaurus shifted rapidly from "standing tall on hind legs like a human with a tail" or "small Brontosaurus-like quadruped with elbows sticking out and tail drooping", to a biped with a horizontal back, and then to a quadruped with arms tucked in and tail straight out. Beginning around 2007, it picked its hands back up, a result of biomechanical studies that showed it could not have put them flat on the ground (Bonnan and Senter 2007). Since then, truly quadrupedal "prosauropods" have proven controversial. L. mafube is perhaps not the ideal candidate to be looking at for quadrupedal features, because we've only got an ulna and a partial femur to go on. McPhee et al. (2018) were not confident that the anatomical features used to restrict quadrupedalism are definitive, and instead proposed a model based on comparison of humerus and femur shaft circumference. Ideally this model would discriminate between bipedal and quadrupedal animals because quadrupeds should have more robust forelimbs than bipeds. (The humerus of L. mafube had to be extrapolated from the ulna, as described in the extended online content and supplementary data.) 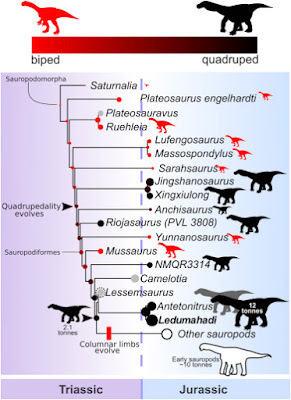 According to their model, quadrupedal sauropodomorphs actually evolved in the Triassic, a little farther along than the splits with the plateosaurids and massospondylids. However, these early quadrupedal sauropodomorphs had flexed joints rather than columnar limbs. This diagram plots not only McPhee et al. (2018)'s phylogeny, but also relative sizes (expressed in the sizes of the colored dots), posture (red dots for inferred bipeds, black dots for inferred quadrupeds, gray for uncertain), and, roughly, geologic age. Figure 2 in McPhee et al. (2018). Finally, a phylogenetic note. McPhee et al. 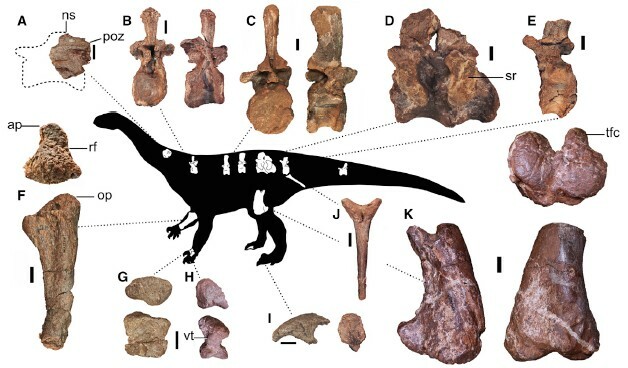 (2018) described Ledumahadi as a non-sauropod, within the family Lessemsauridae. On the other hand, I have Lessemsauridae within Sauropoda. What gives? McPhee et al. 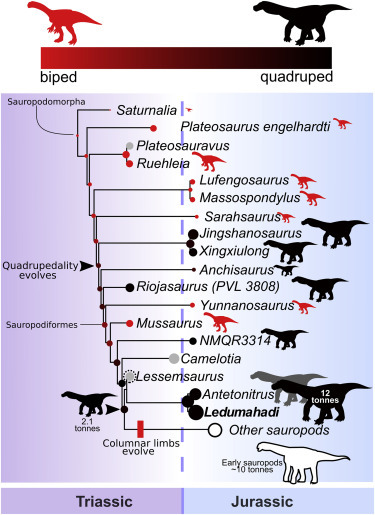 (2018) prefer the definition of Sauropoda used in McPhee and Choiniere (2018), in which Sauropoda is all descendants of the most recent common ancestor of Vulcanodon and Saltasaurus (in other words, Vulcanodon + Saltasaurus). This cuts out Lessemsauridae from Sauropoda. The definition I've been using has Sauropoda including everything more closely related to Saltasaurus than to Melanorosaurus (Saltasaurus > Melanorosaurus). This includes Lessemsauridae. A particular advantage of the McPhee and Choiniere (2018) definition is that it doesn't rely on Melanorosaurus, which as a taxon is more of a pain than you might realize (McPhee et al. 2017; McPhee and Choiniere 2018). Bonnan, M., and P. Senter. 2007. Were the basal sauropodomorph dinosaurs Plateosaurus and Massospondylus habitual quadrupeds? Pages 139–155 in P. M. Barrett and D. J. Batten, editors. Evolution and palaeobiology of early sauropodomorph dinosaurs. Blackwell Publishing, Oxford. Special Papers in Palaeontology 77. McPhee. B. W., and J. N. Choiniere. 2018. The osteology of Pulanesaura eocollum: implications for the inclusivity of Sauropoda (Dinosauria). Zoological Journal of the Linnean Society 182(4):830–861. doi:10.1093/zoolinnean/zlx074. McPhee, B. W., E. M. Bordy, L. Sciscio, and J. N. Choiniere. 2017. The sauropodomorph biostratigraphy of the Elliot Formation of southern Africa: tracking the evolution of Sauropodomorpha across the Triassic–Jurassic boundary. Acta Palaeontologica Polonica 62(3):441–465. doi:10.4202/app.00377.2017. McPhee, B. W., R. B. J. Benson, J. Botha-Brink, E. M. Bordy, and J. N. Choiniere. 2018. A giant dinosaur from the earliest Jurassic of South Africa and the transition to quadrupedality in early sauropodomorphs. Current Biology (advance online publication). doi:10.1016/j.cub.2018.07.063. Sciscio, L., M. de Kock, E. M. Bordy, and F. Knoll. 2017. Magnetostratigraphy across the Triassic–Jurassic boundary in the main Karoo Basin. Gondwana Research 51:177–192. I love the name Ledumahadi. I'm not wholly convinced that little Anchisaurus was a quadruped. Though to be fair, the authors say this character was ambiguous for Anchisaurus ("68.9% likelihood of quadrupedality"). The authors also infer that there was likely "a role for the forelimb during foraging or other slow-speed behaviors in otherwise quadrupedal sauropodiforms". This makes sense, given that lessemsaurids retained a twisted pollex (not known in Ledumahadi), which is thought to have some role in feeding/foraging (or at least, some non-locomotory behavior). This was abandoned in more derived, column-limbed sauropods. If Anchi *was* quadrupedal, it would have been among the smallest adult quadrupedal dinosaurs, which is interesting in its own right: dinosaurs just don't seem to have gone into small quadrupeds, unless they had an excuse (large heads of basal ceratopsians, armor of ankylosaurians).